There are some approximately 37 students studying in Ukraine from Comoros. Students from Comoros are study at medical and engineering universities which are state owned. 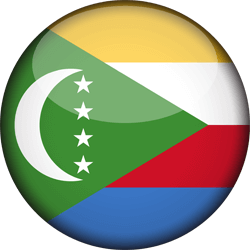 Comoros students are very good at their studies and they have a good academic record in Ukraine. Every year number of students from Comoros is increasing as Ukraine is the most affordable study abroad destination in whole Europe. Students from Comoros are not so good at English as their spoken languages in Comoros are French and Arabic. Students from Comoros prefer to study their desired degree programs in Russian medium of instructions and for that first year they study at preparatory faculty for Russian language course with science subjects. Once they complete their preparatory course,They join their degree program in Russian medium of instructions. Ukraine always welcome students from Comoros and for 2019-2020 also Ukraine is waiting for good number of students from Comoros. Admission process is quite simple and easy for admission in Ukraine. Students from Comoros first of all scan their secondary school certificate copy with international passport copy in the Email of admission office.Upon receiving the scanned copies of required documents admission staff assess their eligibility for study in Ukraine.This process of assessment takes 2 days maximum.Once process is complete,All students are notified by Email for their eligibility or ineligibility. Once the applicant receives the eligibility letter,He/She has to transfer the admission fee to the admission office through any any in Comoros.After transferring the admission fee applicant must scan the transfer receipt of admission fee to the admission office in same Email. After admission staff receive the fee receipt for the admission,The documents of the eligible applicants are transferred to the Ministry of Education,Ukraine for the issuance of official study invitation. This process takes 2 weeks at Ministry of Education,Ukraine and an official study invitation is issued in the name of the international student for visa and admission purpose. This issued invitation by Ministry of Education,Ukraine is first scanned and than sent by courier to the home address of the applicant in Comoros. Those students from Comoros who are found ineligible may scan us more supporting documents for their admission process. As applicant receives the original study invitation in Comoros,He/She prepares the following documents for the Embassy of Ukraine which is nearest to him/her. Applicant take all above mentioned original documents with him//her and travel to the nearest Embassy of Ukraine located in Kenya.Link is below for more information. Once the students for Ukraine is issued to the applicant,Its the responsibility of the applicant to scan us the visa copy along with air ticket copy as admission staff has to prepare his/her reception documents for immigration. We welcome students from Comoros in Ukraine for their higher education ad they may contact us freely anytime through the following details for 2019-2020 intake in Ukraine.